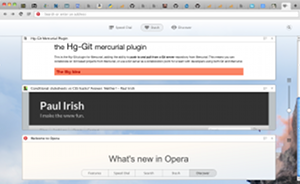 Well, the new version of Opera is now in stable release - Opera 15! 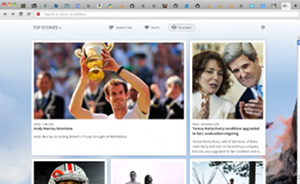 This is the first version based on Webkit instead of Presto, Opera's in-house rendering engine. After using it for a week or so on OSX, I have to say that I'm both pleased and disappointed. I'm also pleased about the appearance. The new Opera is definitely pretty. The old version wasn't bad, but you can tell that they've had designers putting some time in on the new version. It looks very smooth and polished. The status bar is gone. Ditto for the side panel. The bookmark bar is also gone. In fact, bookmarks are gone altogether. Opera Mail has been moved to a separate application (not that I miss it). The RSS reader has disappeared (maybe it went with Opera Mail). Page preview in tabs and on tab-hover are gone. Numeric shortcuts for Speed Dial items have been removed (i.e. they took away what made it "Speed Dial" in the first palce). The content blocker is gone (which is just as well - it was kind of half-baked anyway). And that's just the things I noticed. But the worst part is that those UI features were the only reason I still used Opera. I feel like I'm no longer welcome in Opera land. They've literally removed everything from the browser that I cared about. And what have they given me in return? Well, Webkit, which is no small thing. But if that's all I wanted, I'd just use Chrome or Safari. It's nice, but it doesn't distinguish Opera from the competition. So what else is there? Well, Speed Dial has gotten a facelift. In fact, Speed Dial has sort of turned into the Opera 15 version of bookmarks. You can now create folders full of items in your Speed Dial and there's a tool to import your old bookmarks as Speed Dial items. I guess that's nice, but I'm not seeing where the "speed" comes in. It seems like they've just changed bookmarks to take up more screen real estate and be more cumbersome to browse through. They've also introduced something called Stash, which, as far as I can tell, is also just another version of bookmarks. But instead of tile previews like Speed Dial, it uses really big previews and stacks them vertically. They're billing it as a "read later" feature, but as far as I can tell it's functionally equivalent to a dedicated bookmark folder. I guess that's nice, but I don't really get the point. And, last and least, there's the new Discover feature. This is basically a whole listing of news items, right in your browser. Yeah, 'cause there aren't already 42,000 tools or services that do that. One that's directly integrated into the browser is just the killer feature to capture the key demographic of people who like to read random news stories and are too stupid to use one of the gajillion other established ways of getting them. Brilliant play, Opera! Now, I'll grant you - visually, the new Speed Dial, Stash, and even Discover look fantastic. They're very pretty and make for really nice screenshots. However, I just don't see the point. I can imagine some people liking them, but they're just not new or innovative - they've just re-invented the wheel in a way that's more convoluted, but not visibly better. Overall, I get the feeling that Opera 15 was designed by a graphic designer. Not a UI designer, but a graphic designer. In other words, it was built to be pretty rather than functional. I know I've sometimes had that experience when working with a graphic designer to create a UI - you get mock-ups that look beautiful, but were clearly created with little or no thought to their actual functionality. So you end up with workflows that don't make much sense, or new UI elements with undefined behavior, or some little control that's just "thrown in" but represents new behavior that is non-trivial to implement. Honestly, at this point I think it's just time to switch to Chrome. I already use it for all my development work anyway, so I might as well use it for my personal stuff too. I had a good run with Opera, but I just don't think the new version is going to meet my needs. Maybe I'll take another look when version 16 comes out. Den letzten einigermaßen bekannten anderen Browser Opera hat ebenfalls WebKit dahingerafft, siehe zum Beispiel hier und hier und hier und hier und hier. Zu aufwändig sei es gewesen, mit den Entwicklungen Schritt zu halten, und für ein Nischenprodukt sei man nicht mehr bereit, verkündete man aus dem Hause Opera Software. Die Masse macht’s. Opera turned into chrome. I still have Opera 12, but, since I've installed Opera 18, 12 it's crashing everytime. shame. Enter the sum of 91 and 57.